Man Utd reportedly failed in a bid to prise Mario Mandzukic away from Juventus this summer despite Jose Mourinho said to have been keen on a swoop. The Red Devils were only able to complete three signings this past summer, with Lee Grant, Diogo Dalot and Fred securing moves to Old Trafford. 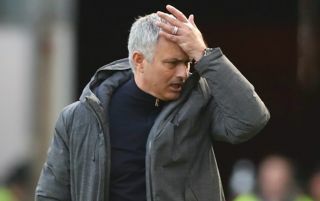 After finishing 19 points adrift of Premier League champions Man City last season while ending the year trophy-less, more was arguably needed to strengthen Mourinho’s squad to make them genuine contenders, but he’ll have to now continue with the group at his disposal with the transfer window closed in England. According to Calciomercato though, he tried to sign Mandzukic in the window just gone with the Croatian international described as his ‘first choice’ having continued to impress in Turin while reaching the World Cup final in Russia earlier this summer. However, as seemed to be the case with his bid to sign a defender, as noted by the Independent, the Portuguese tactician fell short as Massimiliano Allegri was able to convince his attacking stalwart to remain where he is expected to play a key role in Juve’s continued push for domestic dominance and to end their wait for Champions League glory while even potentially signing a new deal. He will likely now face more competition for a starting berth though given the arrival of Cristiano Ronaldo from Real Madrid, but not even that was seemingly enough to convince him that a move to Man Utd was the better of the two options. It’s easy to see why Mourinho was reportedly keen on Mandzukic given his quality in the final third as well as his work ethic and tenacity which would undoubtedly suit the demands of the Man Utd boss. Nevertheless, he remains in Italy while Mourinho will have to continue to try to get the best out of the options already at his disposal in attack.